Use a fixed 6500K value for the white balance during the capture. Put your HDRI in Blender and start the render. Calculate the EV of one of the bracketed exposure photo using the EXIF data. 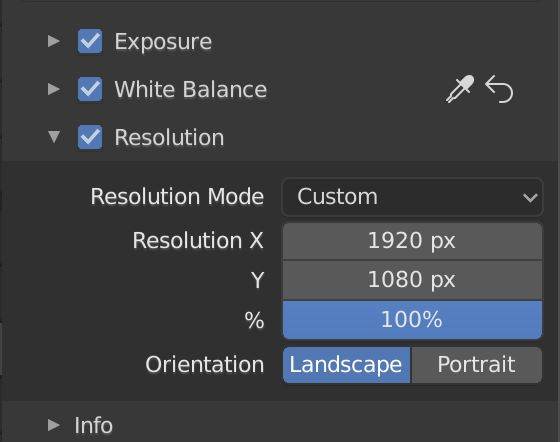 Input that value in the Photographer add-on and see if the render brightness matches the reference photo. If not, adjust the exposure of the HDRI in Photoshop or other photo editing software. Latest version: 2019/01/9 : 1.2.2. Fixed typo, this is unforgiveable. Thanks tmammela for reporting it. I’ll now be working on the 2.8 version! Version 2.0.0 for Blender 2.8 is now available. Please read the warnings below! Thanks @joemoehobo for starting porting over to 2.8, thanks @hypersomniac for the viewport update trick. There are still some registration errors for the addon preference, so you can get errors when enabling / disabling / re-enabling the addon during the same Blender session. Ignore the error and click again to enable the addon. To avoid breaking the autosave, I re-introduced a “Apply all settings” button. 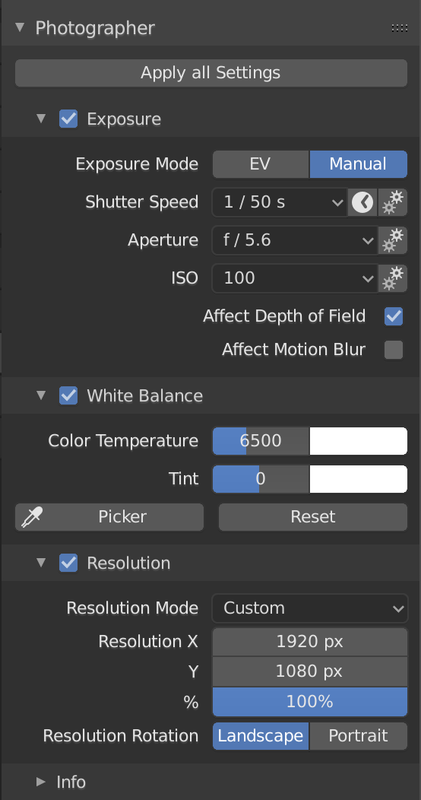 If you changed Resolution, Color management Curves or Depth of Field default blender settings, they will override the Photographer settings. 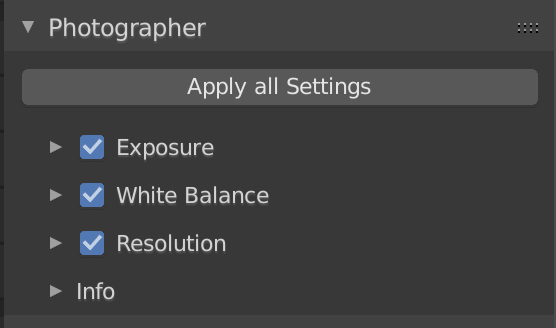 You can use that button to reapply the Photographer settings all at once. Both issues were already present in 2.79 so there is no regression there. Amazing to see a 2.8 port of this addon, I’ve been meaning to check back here for a while. I’m excited to get my hands on this one again! I think it’s pretty unacceptable to break the autosave, so I fixed 2.79 version as well with version 1.2.3. Same warnings as the 2.8 version, I think it’s not too much of a problem to have to reapply the settings in rare situations. This is awesome addon. Glad to see this addon in 2.8. I have a question about the functionality of this addon with EEVEE. EEVEE’s Depth of Field and Motion Blur still have got limitations. They are not feature-complete yet. Could this addon solve the problem a bit? Thanks! The add-on is only an interface layer on top of the rendering options that already exist in Blender, so unfortunately, it won’t fix EEVEE’s limitations. 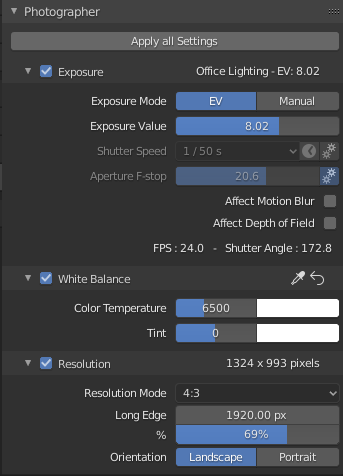 Perhaps this is beyond the scope of this plugin, but what would the chances be of adding lens presets, so you can pick from a variety of real-world lenses, to go along with the other camera settings of being able to pick from a variety of real-world cameras. I imagine that would automatically set up the focal length and DOF and such. It is out of scope in terms of lens visual signature (vignetting, sharpness, distorsion, chromatic abberation, bokeh shape) because these can only be done in compositing at the moment, and even then, I find the compositing tools to be pretty limited (and slooooowwwww). This would also require to do some lens tests and recordings (not all of this information is available online unfortunately). So it would only be a limit on the Aperture range (like f/2.8-f/22) and a focal length preset (like 50mm, or 24-105mm), and I don’t think it makes much sense to only have that? Or is it just me? That being said, having a list of different Lens Post-Processes in the Compositor is totally doable. Unfortunately the nodes are bit limited and don’t have a way to manage a list of values from Presets (AFAIK), but you could always append a specific lens node group. Oh well, dang. That’s a shame. Thanks for the response, and thank’s for the plugin. Good stuff. It’s up to you if you want to use this or not, but here it is. This makes it possible to pick white balance even when the panel is closed, and takes up a lot less space. Version 2.0.1 for Blender 2.8 is now available. UI improvements based on @William 's suggestions, thanks a lot for your help! The UI should now be less “jumpy”, enabling or disabling settings instead of hiding them. Relevant information is visible even when collapsing panels. I prefer to keep this kind of info visible as I tweak the settings rather than in a different panel.